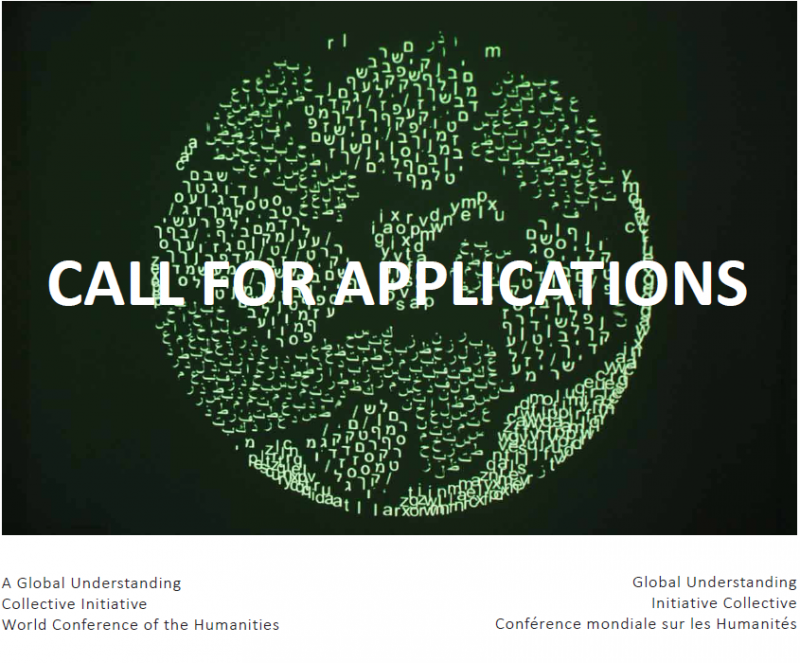 The International Year of Global Understanding (IYGU 2016), Conseil International de la Philosophie et des Sciences Humaines (CIPSH), UNESCO-MOST & Mémoire de l’Avenir (MDA) launch a PROJECT and an OPEN CALL designed to create a Global Movement of artists that can testify the impact of the Arts and Artists in Societies, and the importance of local initiatives on a global scheme! Works selected will be presented online in global forum. A rigorous selection of artists’ proposals from each of the 206 member countries of the United Nations, will compose a demonstrative installation presented at the World Humanities Conference in 2017 in Liège, Belgium, organized by IYGU, UNESCO, ICPHS and the Foundation for the MHC. In parallel, online, publication of a broader range of proposals and projects will create an international dynamic movement of artists that will initiate an active and immediate sharing between research, knowledge, methods, commitments and expertise around the world. GOAL: To unite artists around the world in order to demonstrate the involvement and contribution of the arts in society. Art and culture are active agents in social, economic and political action. They speak to the solidarity between peoples, of their situations and ways of life… They have the ability to change mentalities and encourage action in every domain of society. The responsibility of an artist lays not only in his aesthetical research or with his/her intellectual impact, but also with his/her ability to influence, challenge, propose, critique, and raise awareness. Art is a way to question and to discover, while searching for new ways to express, to resist, to act… Expressing a unique and subjective point of view is an ethical and esthetical imperative. Hence, art is a way to recognize the endless pluralities of ideas, histories and identities. Arts & culture can contribute to an intuitive, sensitive and knowledgeable meeting between differences, leading to the recognition of similitude and universalism. YOU, artists of all forms of expression: fine arts, photography, film, music, performance, creative writing, poetry, numerical art, architecture, culinary artist... are invited to create a short video (1:30 max), in which you express, in your native language, the role of artists and the arts in society. A larger selection of projects, together with the above first collection, will be also edited on line, constituting an active platform of exchange of resources, witnessing the richness of Cultures, ideas, engagements, expressions and actions. If in your work YOU QUESTION social or political challenges such as ecology / nature / science / education / labor / limits and borders / migration / urban space/ collective & individual memories / living together / women, children human rights... SHARE IT, AND SEND US YOUR VIDEOS! The Arts and Society those Projects will be available on The platform, will be coordinated by the IYGU-MDA Regional Actions Centers’ online. IYGU (International Year of Global Understanding 2016) The International Year of Global Understanding (IYGU) addresses the ways in which we inhabit an increasingly globalized world. How do we transform nature? How do we build new social and political relationships for the emerging global reality? Societies and cultures determine the ways we live with and shape nature. They influence how we perceive the global consequences of our everyday actions. We need to understand what our daily actions mean for the world as a whole in order to overcome global challenges. MOST (Management of Social Transformations) is UNESCO’s intergovernmental science programme on social transformations. MOST works with governments, social and human science communities and civil societies to improve connections between knowledge and action, connections that are one key to positive social change. Liège will host the World Humanities Conference from Sunday, 6 to Saturday, 12 August 2017. It will gather about 1800 participants from all over the world working in the fields of science, politics, art and communication, as well as representatives of international, governmental and non-governmental organizations. CIPSH (International Council for Philosophy and Human Sciences) The ICPHS is a non-governmental organisation within UNESCO, which federates hundreds of different learned societies in the field of philosophy, human sciences and related subjects.